RR501 Foam was developed to have a slower reaction time to allow the material to spread further. Because of the distance the material can travel, RR501 is percfect for undersealing and stabilizing joints on rocking slabs from slab curl. RR201 Was Developed to have a fast reaction time and less spread to have more control when lifting smaller slabs of concrete. Designed to mimic the speed of traditional hydraulic mudjacking. RR401 was developed to have a fast reaction time and less spread to have more control when lifting smaller slabs of concrete. Designed to mimic the speed of traditional hydraulic mudjacking. Twice the Density of the RR201 this foam is specially designed for heavy lifting and high traffic areas. Exceeds typical specifications for DOT under sealing projects. DC 333 a new state of the art fire retardant paint using proprietary cutting edge intumescent fire retardant, that has been proven by laboratory tests to have the ability to help prevent vertical flame spread, flashover and to help prevent fire penetrations of a wall assembly. YOUR ONE STEP SOLUTION FOR POLYURETHANE FOAM “15 MINUTE THERMAL BARRIER” AND “IGNITION BARRIER” RATINGS. DC315 is a Certified Warnock Hersey listed and rated product which has passed certified testing for both the (UL-1715) 15 minute Thermal Barrier and the NFPA 286 (AC-377 standards) as an Ignition Barrier. 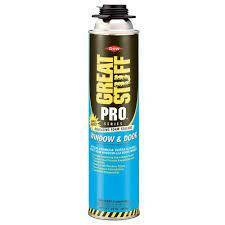 GREAT STUFF™ Gaps & Cracks is a polyurethane foam gap/crack filler for use all around the home. Paintable, stainable and sandable, Cures rigid, UL classified. Improves the overall comfort of your home by providing a long lasting barrier between you and the critters who live around the exterior of your home.